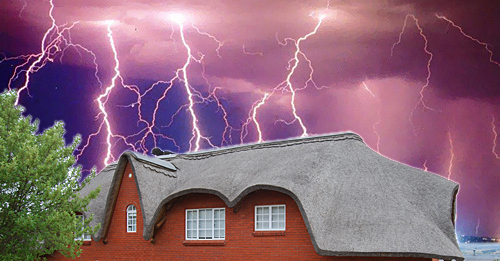 Thatch roofs are most susceptible to be set alight by lightning than any other roof type. For the protection of the public and property the South African National Standard 62305-3 was introduced in 2011. SANS 62305-3: Protection against Lightning (published in 2011) is drawn from an international standard, IEC 62305. Part 3 deals with “physical damage to structures and life hazard”. Remember that anything related to electrics must be dealt with by a qualified and registered electrician. This part of IEC 62305 deals with the protection, in and around a structure, against physical damage and injury to living beings due to touch and step voltages. The main and most effective measure for protection of thatch structures against physical damage is considered to be the lightning protection system (LPS). This usually consists of both external and internal lightning protection systems. disperse the lightning current into the earth (using an earth-termination system). An internal LPS prevents dangerous sparking within the structure using either equipotential bonding or a separation distance (and electrical insulation) between the external LPS components and other electrically conducting elements internal to the structure. occurrence of dangerous touch and step voltages by physical restrictions and/or warning notices. The type and location of an LPS should be carefully considered in the initial design of a new structure, thereby enabling maximum advantage to be taken of the electrically conductive parts of the structure. By doing so, design and construction of an integrated installation is made easier, the overall aesthetic aspects can be improved, and the effectiveness of the LPS can be increased at minimum cost and effort. 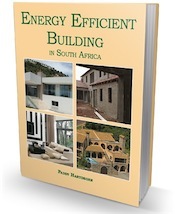 Once construction work on a site has started, access to the ground and the proper use of foundation steelwork for the purpose of forming an effective earth-termination, may well be impossible. Therefore, soil resistivity and the nature of the earth should be considered at the earliest possible stage of a project. This information is fundamental to the design of an earth-termination system and may influence the foundation design work for the structure. Regular consultation between LPS designers and installers, architects and builders is essential in order to achieve the best result at minimum cost. If lightning protection is to be added to an existing structure, every effort should be made to ensure that it conforms to the principles of SANS 62305-3. The design of the type and location of an LPS should take into account the features of the existing structure. Specific requirements for an LPS in structures dangerous to their surroundings due to the risk of explosion are under consideration. Additional information is provided in Annex D for use in the interim. This part of IEC 62305 is not intended to provide protection against failures of electrical and electronic systems due to overvoltages. Specific requirements for such cases are provided in IEC 62305-4. Specific requirements for protection against lightning of wind turbines are reported in IEC 61400-24 . The following referenced documents are indispensable for the application of this national standard. These references are listed in the standard. For dated references, only the edition cited applies. For undated references, the latest edition of the referenced document (including any amendments) applies. How do these new regulations apply to an existing house (more than 25 years old) that has a treated thatch roof? Since these regs are from 2011 they don’t, though it is in your interests to ensure the house is safe. can lapa be fully enclosed by plastered walls with windows and doors? what is the difference between lapa and thatch roofed room? A lapa is usually open-sided so might not require plans. A thatched roofed room is a structure that WILL require plans.